actualy guys this article in my opinion says one important thing look for 1 peg to validate the sword is real handmade the old way from japan. its important we support this beautiful heritage and art form. knwing things like this help to do so. the japanese made sword will is one that will last throught time when all other metals and forging weapons and fighting have been used up. these blades will be unchalanged. as a more than avid swordsman i know the value of these blades and this article only brought back to my attention that indeed 1 peg was always the original standard in japanese hand forged katanas. spread the word. its time we buy japanese! This makes a lot of sense to me. So basically what I get out of this blog is that a single peg well carved tsuka is really an important feature for long lasting tsuka. While double peg might be good for a short term fix for a mass market katana tsuka, really one should carve (or have one carved) a new tsuka to match your nakago if you want your tsuka to last. By the same token, if the fit is good the lateral stress on the second peg should be taken up by the tsuka, yes? 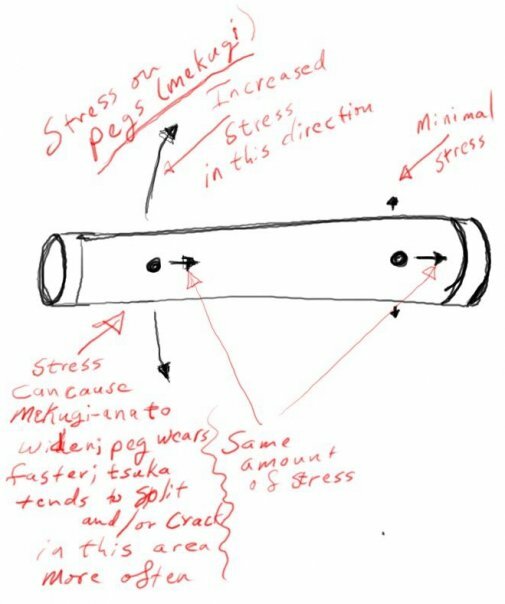 The only time the stress should be transferred to the peg is if there is any slop in that fit. At that point it's going to elongate the peg hole in the tsuka and cause problems. That said, if you've got that second peg, you'll stop the end of the nakago bashing around in the cavity of the tsuka and making the slop even worse. The point is in problems with mass produced swords, where tsuka is not properly fit for nakago. That's where the second mekugi is truly needed. I there won't be one, there will be realy sensible play of far side of nakago in tsuka. That's why everybody is used to two mekugi. My opinion is there is no need in second mekugi if tsyka fits nakago well.